When I first imagined travelling around the world for a year, I imagined lounging around, reading trashy novels, having fabulous conversations, sunning, drinking and generally relaxing. The reality of long term travel has not been that…until this week. This week we hit the southern coast of Turkey…where land meets Mediterranean…and the sun, surf and sand come together in a perfect three part harmony. We started in Olympos, where ‘camps’ have treehouses and bungalows set amongst orange and pomegranate trees. In the height of the season this place must be humming…but now, at the end of the season, the music is set on low and the sound of backgammon stones can be heard up and down the one gravel road in ‘town’. Our days were supremely lazy…rising late to have breakfast…reading, relaxing and surfing the net until the call of the beach was too loud to ignore…strolling the 10 minute walk to the beach through the ruins of Olympos…sunning, sunning, sunning…stopping on the return trip for a recharging beer and a quiet game of backgammon…back to camp in time for the dinner bell…some more backgammon and raki…and to bed we went. Seriously lazy! 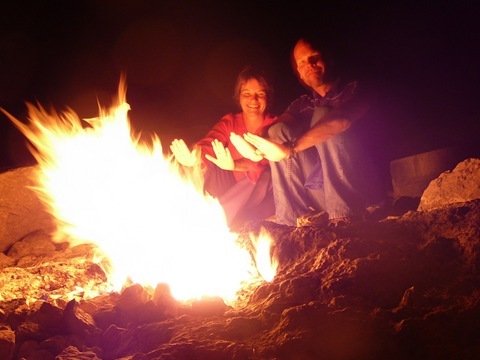 The one outing we did manage was to the slopes of Mount Olympos where chimerae flames burn right out of the rocks. Although reportedly much dimmer than back in the day when mariners could navigate by them, they are still a wonder and an eerie sight in the jet-black night. 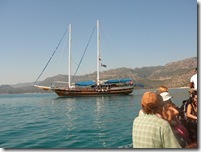 Our next stop was to be Fethiye/Oludenis…but how to get there? The absolute best way to travel along the Mediterranean coast of Turkey is by gulet, a type of wooden sailboat, and so we booked ourselves passage on a 4 day/3 night cruise. It was fabulous!! There is always worry when joining a group that things might not turn out quite as imagined…but we lucked out once again. We were a large group of 18…Canadians, Americans, Australians, South Africans, Turkish/Germans…and we all got on famously. We talked, and drank, and swam, and played, and sunned, and read, and relaxed the entire time. The first night saw us boarding a small boat and putt-putting up to the edge of the harbour where the Pirate Bar had a party in full swing. Right there, in the middle of nowhere, with the stars shining and the Mediterranean lapping at the dance floor, was a nightclub filled with sailors, new and old, grooving to the music and drinking the ice-cold beer. Definitely surreal. My favorite day was probably the day we had the worst weather. The waves were high enough to rock the boat significantly and, as we sat in the back, I was a little nervous. Some of the guys were at the bow, holding the ropes, and surfing with the boat…it looked like fun. In no time the adrenaline junky in me took hold and up we went. It was amazing!! Waves would approach, the bow would rise and then the water would disappear leaving the bow to plunge into the trough (okay, I may be taking some artistic license here…but it was a little rough). I hooted and hollered with every wave and was slightly disappointed when we rounded the point and the waves calmed down. Once we made harbour the clouds were still threatening but that didn’t deter us from jumping in the water as soon as the anchor was set. We pulled down a raft and spent the rest of the afternoon making up games, diving off the boat railings and generally horsing around like 12 year olds…we didn’t come out until we were exhausted and wrinkly. Too much fun! I think I had a smile on my face even when I was sleeping that night. Once the boat docked we were on our own again and made our way to Oludenis/Hisaronu. Here British tourists come by the plane-load for their one week holiday and time in the sun. Seriously, the place is like a mini seaside holiday spot for them…I think we may have been the only non-Brit tourists there. The food is all British (English breakfast, liver and onions, curry…all with chips) and the locals all speak English with a British accent. Seriously weird. The beach is beautiful though, beer is served on the beach, and paragliders fill the sky doing tricks and landing right on the beach. So many of them that, at times, it looked like the sky was filled with mosquitoes. The best ones being the brave souls that jumped from a motorized hang-glider high in the air to free-fall and then pull their chute at the last moment. We broke our sloth-fast here by finding the start of the Lycian way and doing a serious 16 kilometer hike on our last day. 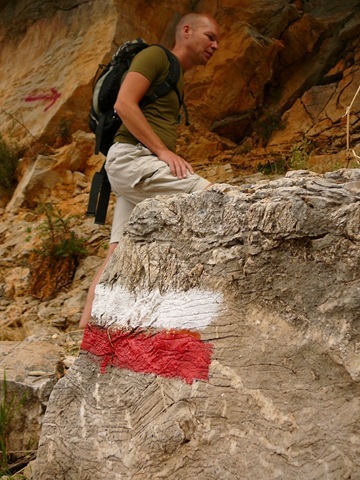 We hiked over the mountains and through the valleys of pine forest that connect the village of Hisaronu with the village of Faralya. It was a great hike that took us through some small villages and farms, waving and offering a tentative ‘merhaba’ to all the locals we passed. And so comes to and end, our vacation from our vacation. Our tans are dark, our livers taxed and it’s time, once again, to hit the road. ← ScooterBoy and ScooterGirl Ride Again! I loved this post! Sounds like you had a fantastic vacation away from your trip. Gotta do that once in a while to maintain your sanity. Enjoy!! We took a vacation from our RTW trip in Cirali, very nearly Olympos, as I’m sure you know. We had a really bizarre experience where we stayed, and it was WAY too hot (I bet it’s perfect this time of year – we were there in August), but it was certainly memorable! This sounds sooo wonderful Gillian! I can picture you sleeping with the smile on your face. I will keep these thoughts with me when I am having ‘a day’ at you know where! I have a smile on my face just reading your post. 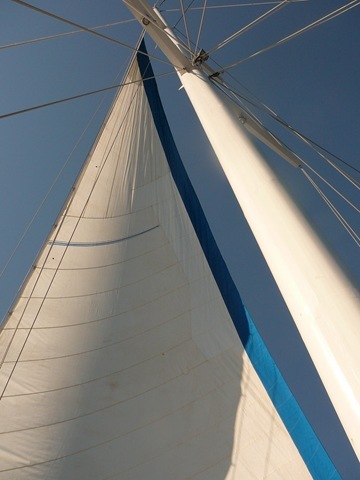 I loved reading your story about our boat trip while reminiscing in my own mind. Your descriptions are phenomenal, you’ve got a great way with words. I think the bow boat surfing idea was my fault but I think everyone who came up ended up having a great time. Ahhh, so it was your fault Eric…well it was a hoot…the whole trip, I really enjoyed it. Glad you’re reading along…talk soon. Who did you guys book your cruise through? Did you do it in advance? We’ll be heading to Fethye tomorrow or the next day. Thanks! @Danny&Jillian: We booked through V-Go Cruises. I hope you decide to take a cruise because it really was just too much fun! !